Dynamic PowerPulse - it's metallic powdered element shifts the weight forward and gives extra power for every kick. Xternal Heel Counter - gives extra comfort, support and helps improve stability. Engineered Predator Technology - has the swerve zone, for greater accuracy and the power zone for power. 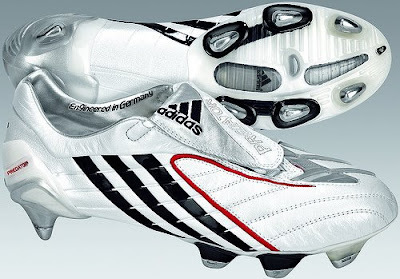 Adidas also provided "The Predator" to fit in different fields such as soft, hard, astro turf, indoor, and firm. Even I don't like shopping. But still I like every thing, like you. I only purchase online now-a-days. I just ordered "football shoes" football shoes from shoedeals4u.com and waiting for its arrival. Football Shoes from Cheap Football Shoes suppliers. Football Shoes Wholesalers offers high quality Football Shoes at lowest price in Market! I would like to tel that, always use Adidas's footwear for soccer and other games. In fact, most of player really like to put on Adidas footwear for playing. This Adidas Predator is looking very excellent, nice to it.